If I had a dollar for every time someone asked about the pickup under the shelter, I would have enough money to fill its gas tank—several times. I’ll admit the Ford F-150 does look a little dusty and under-exercised. However, the 1986 fleet-side is cranked 52 times a year to make sure it’s ready for a special day. That day came last week, but I’m getting ahead of myself. For about a dozen years, we lived across the street from my parents. For Alan, Emily and Eric, every trip across Ninth Street made them smile, because their grandparents made all their grandchildren feel special. Decades later, our three can describe the opening sound of their grandparents’ hollow-core back door, and for certain, they knew the whine of their granddaddy’s six-cylinder. I think it had something to do with the clutch, as he shifted the three-on-the-tree gears. Every time I turn the ignition switch and step on the clutch, I can feel him sitting beside me. Big Dink was Depression-Era thrifty. Even though he could afford a new truck, he waited until he was 64 to drive one home. And when the air conditioner conked out, he had it fixed. But the next time it quit, he just rolled the windows down and carried on. He loved that truck, and our children loved riding with him, air conditioning or not. In 1997, for his 75th birthday, sisters Sandy, Sheila and I decided our dad deserved a new truck—another F-150. We had just one request: He should keep his old truck. Big Dink was beside himself. Like a kid with a new bike on Christmas morning, he drove off to show his friends. A year later, he was gone. We debated and decided to sell the classy new ride. We vowed we’d never part with what would always be “Granddaddy’s truck.” That’s why it’s been pampered for 19 years, awaiting last Friday. My dad died before any of his great-grandchildren were born. You’ve heard me say this before: “People die twice. The heart stops first, then the memories.” I was determined our eight grandchildren would know their great-grandfather through family stories, repeated over and over. 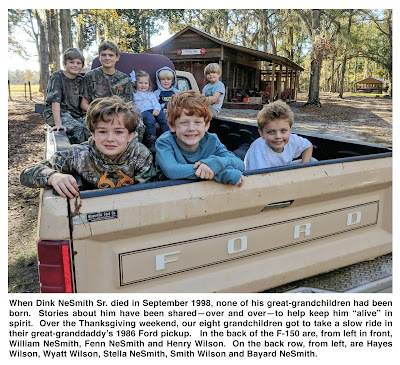 And what better way—on the weekend of Thanksgiving –than to take them on a slow, dirt-road ride in his pickup truck? With a little barnyard ingenuity, I rigged an old school-bus seat on a wooden platform. Wyatt, Hayes, William, Henry, Fenn, Smith, Bayard and Stella clambered up the tailgate and jockeyed for a spot on the burgundy bench from a retired Blue Bird. Three wound up sitting on the floor, but no one was complaining. When Eric eased off the clutch, they all got to hear that nostalgic whine. They had heard the stories long before. And now, they were making their great-granddaddy smile down from heaven. Who could imagine that old tan truck, with all its nicks and dings, could make for so much happiness and laughter among eight children?